Games Like Prototype: Free Roam Action Adventures '+g+"
Prototype is an action-adventure open world game series from Radical Entertainment. Set in post apocalyptic New York city the player is transformed into a shapeshifting killing machine with amazing powers by a deadly virus known as Blacklight. If you like playing more free roam action-adventure games like Prototype and looking for more games similar to it then check out the below list of recommendations and don't forget to mention if we miss any games as we keep on updating this list. Infamous 2 is an PlayStation 3 exclusive 2011 open-world action adventure game developed by Sucker Punch Productions and published by Sony Computer Entertainment. Set in the city of New Marais Cole MacGrath returns with new super powers to stop "The Beast" an extremely powerful enemy before he can destroy the world. Crackdown is a series of free roam action adventure games published by Microsoft studios exclusively for the Xbox 360. Till date two games are released (Crackdown and Crackdown 2) and both are set in "Pacific City" a fictional world where the player Jumps into the shoes of a genetically modified super agent to fight off mutants and other vicious gangs. Just Cause 2 is an 2010 open world action-adventure game developed by Avalanche Studios and distributed by Square Enix. Rico Rodriguez an Agency Operative is sent to the island nation of Panau to overthrow Baby Panay an evil dictator with the help of rival factions and to find a former friend and mentor Tom Sheldon accused of stealing agencies top-secret military Intel. The Incredible Hulk is a 2008 free roam, open world game based on the Marvel superhero Hulk. The player takes the role of hulk must rescue a teenager named Rick Jones from the mysterious organization named "Enclave". Spider-Man: Shattered Dimensions is a action-adventure platformer game featuring Marvel Comics superhero Spider-Man. The game features four universes allowing the player to play as four different Spider-Men (Amazing Spider-Man, Spider-Man:Noir, Spider-Man 2099, and Ultimate Spider-Man). 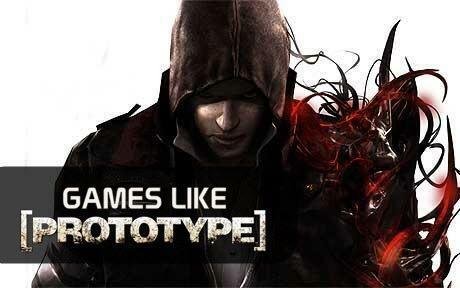 Just Cause,....if you can think of more games similar to Prototype (series) then don't forget to mention them in comments.